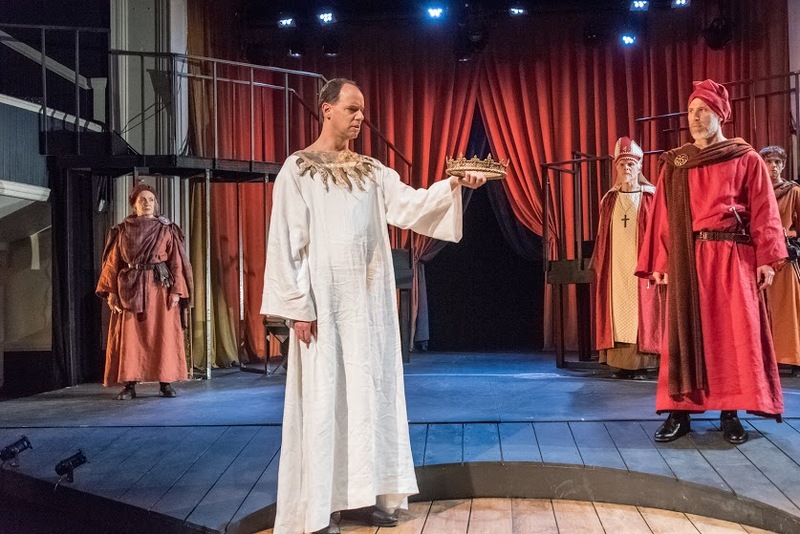 (Cambridge, MA) Richard II is not about a Danish prince languishing over a ghost’s warnings or an elderly king like Lear, mad with grief due to age and family strife. No, this is a story about the abuses of power and a complex man who both understands why he must give up his throne but is honest enough to admit to himself that he just really, really doesn’t want to. Doug Lockwood is a particularly peevish Richard II, spoiled by circumstance and greedy to make money for his ultimately misplaced effort in the Irish Wars. His undoing is foreshadowed early on: he consents to a duel between two noblemen but then stops it prematurely, he considers getting rid of a potential foe, and openly looks to robbing a dying man of his fortune to fund his own machinations while trying to express condolences. Richard II is utterly awful. So why emphasize with him at all? One reason is that Lockwood plays him so perfectly. His Richard is a spoiled brat whose experiences only humble him in time for his downfall. His greatest abuse is not his malice but his flighty indecision. In a minimalist production like this one, the theater’s space balloons with the presence of its actors. The sparse area is more like a Gothic cathedral with high arches than a small stage. It’s almost a shame to see any set piece larger than the bath tub where the king has his soak. Beyond the title character, Robert Walsh stands out as the Duke of York. He’s a presence continually harried by his man-child king, the increased poverty of England, and the frustrations of his own, clownish family. Walsh also possesses a voice of distracting gravity, one that fits both his harassed presence and a side character who can do nothing but look on as the king’s regime collapses like a house of cards. Some of the costuming by Tyler Kinney feels reminiscent of Game of Thrones, which probably has more to do with what George R. R. Martin has taken from the text (a prominent character is Malcolm Ingram’s John of Gaunt, Duke of Lancaster) than inspiration from the show, but the comparison to contemporary prestige television feels apt. This is a play of political intrigue, but most of the drama doesn’t come from the body count. It’s the way in which people dissolve under power. Blades are pushed through flesh, but there’s no spectacle to it. There’s no blood to be marveled at in this exquisitely pared down production, just a crown passing through the grasp of a man who doesn’t know what he had until it’s all but lost. This entry was posted in Shakespeare and tagged 2016, Actor's Shakespeare Project, Allyn Burrows, Boston, Danish, Doug Lockwood, England, February, George R. R. Martin, ghosts, Gillian Daniels, Ireland, King Lear, MA, Malcolm Ingram, March, Richard II, Robert Walsh, Stratton McCrady, Tyler Kinney, William Shakespeare, York by gilliandaniels. Bookmark the permalink.